Who has the best tune that comes with a kit? I don’t have anyone close that can do a custom tune. Tons of people have me included. Order parts from the poster above your post. TPMS From GMT 900 Recognized by K2 Truck? They are both 315 MHz, 2019 moved to a 433mhz you would be good to go. 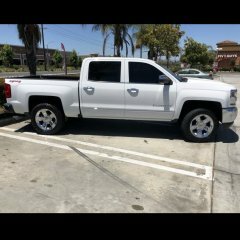 I have a 2014 Sierra that I installed the BDS 4” lift on. No wheel well trimming with the 285/70/17 tires. No changes with driveshafts are needed. I am running a -12 offset though. The BDS site will tell you if you can run the stock wheel. Make sure y’all use the supplied window stickers for full performance! Just go to fastheadlights, he will fix you up with a easy retrofit kit. Best mod ever if you drive in rural areas. No buzzing relay or wiring in of relays. Simple and awesome. I tried without the rear spacers after I installed my 4” BDS lift. Eventually my OCD won out and I installed 1.5” spacers. It just looked wrong when I was walking up to it from certain angles. Of course it is just a visual thing that you don’t notice once you’re in the seat. I also believe it is easier for the wheels to follow the same track while in mud and snow. I had my first good night drive since installing my Morimoto D2S 4.0 kit from fastheadlights. Combined with the Rigid fogs this setup absolutely rocks! I knew the stock headlights sucked but wow what an improvement. I could see far enough to maintain a good speed and could see the ditches and wider to watch for wildlife. Than you fastheadlights! I am running the 35W Hylux ballasts without any relays or direct connections to the battery. You have to make sure the BCM update that bumps up the the voltage. That is the update where GM tried to appease the the people that purchased the 14/15 model year Sierras. Any more details and part numbers? Glad you don’t drive on any roads near me! I guess I will wait patiently for the 2014 mod harness before I order my red backlit switch. Is it ready yet?....... How about now? Now? Aargh! Highly recommend Phil from Fastheadlights. Knows his stuff and is a small enough business to still care about the customer.